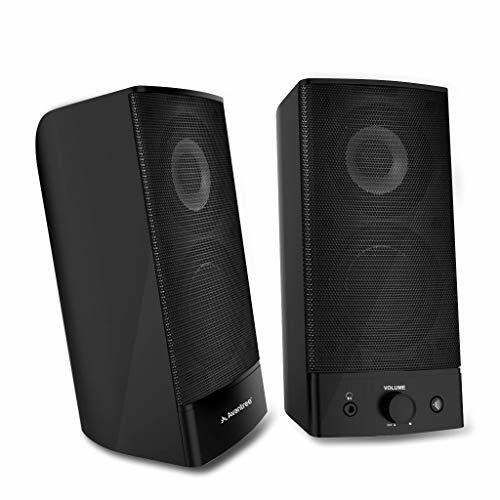 Avantree SP750 is a 2-in-1 Bluetooth and wired PC speaker. It delivers an amazing sound. Easy to pair with any desktop, laptop, tablet, smart phone. Specifications * Bluetooth version: 4.0 * Wireless operational range： up to 10 meters * Speaker output power：10W * Speaker Frequency range：100Hz ~18kHz * Charge voltage：12V, 1A * Size: 3.54'' *3.54''* 7.48'' (90MM*90MM*190MM) *Net weight: 2.82lb (1280g) What's in the box? * Avantree SP750 * AC Adapter * Quick user guide Warranty We offer 24 Months Warranty for normal use. Live online support, Telephone Support, and email support are available. Video user guide are available also from Avantree site. Support Any issues or suggestions, contact us via our US toll free No, Intl number, OR email us and 1 business day reply is guaranteed. We are committed to 100% customer satisfaction. - CERTIFIED QUALITY AND 24-MONTH WARRANTY: Feel confident in your purchase - this product is certified CE and FCC compliant. In addition, you also receive a 24-month warranty. - IN-1 WIRELESS & WIRED: Classic desktop PC speaker with built-in Bluetooth. One simple click switches between Bluetooth and Wired Aux-in mode. Use it as your default conventional computer speaker, then at the press of a button stream music from any portable device, mobile phone, tablet, laptop or even smart TV. - EASE OF USE: Front-panel access for power on/off, volume control, and Bluetooth pairing. A headphone jack for private listening, and a line-in for other audio devices. AC adapter included so you can stream your music continuously. - CHARGE FREE & LONG LASTING: Powered by the AC adapter - no need to charge. Without a built-in battery, this speaker lasts much longer than many battery-powered Bluetooth speakers in the market.